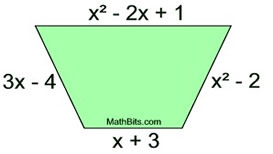 Find an expression for the perimeter of the quadrilateral shown at the right, in terms of x. 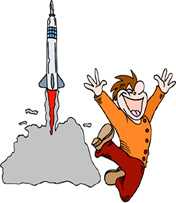 The height reached by a model rocket launched straight up into the air from a starting height s (feet) off the ground, at a velocity v (feet per second) after time t (seconds) is modeled by the polynomial -16t2 + vt + s. Find the height reached by the model rocket after 8 seconds, if launched from a 1 foot launch pad at a velocity of 184 feet per second. 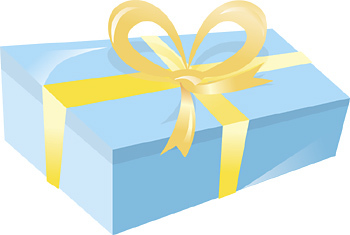 A rectangular solid (a closed box) is to be covered with a decorative paper. If three of the surface areas of the faces of the box are 48ab in2, 32ab in2, and 96ab in2, write a polynomial that expresses the total surface area of the box, in terms of ab. A new 18 ft. by 36 ft. swimming pool is being surrounded by a concrete sidewalk (x ft. wide all around) and a planting area (y ft. wide all around). Express the amount of fencing needed to enclose this new pool addition (the pool, the sidewalk and the planting area), in terms of x and y. The side of a game cube is represented by x - 4, as shown at the right. 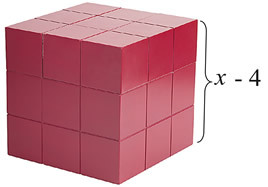 Express the volume of the cube, in terms of x. The glass in a picture frame measures 8 in. by 10 in. The border of the frame is a consistent x inches in width. Express the area of the frame's border, in terms of x. 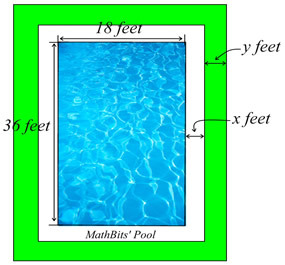 The area of rectangle ABCD is 2x2 + 17x + 30 square units. 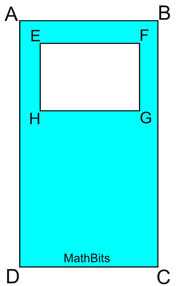 The area of rectangle EFGH is x2 - x - 6 square units. If EFGH is cut out of ABCD, express the area, in square units, of the shaded region which will be left (in terms of x). 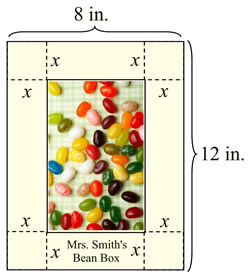 The length of a rectangular billboard is three feet less than twice its width, w. Express the area of the billboard in square feet (in terms of w). 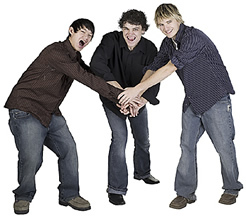 The ages of three friends in a band are represented by three consecutive even integers. If the youngest age is represented by a, express the sum of the ages of the friends, in terms of a. 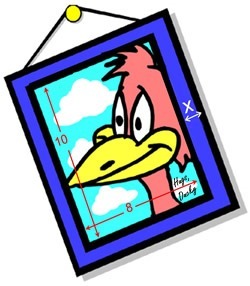 The area of a parallelogram is 10x2 + 16x - 8 square units. A circle has a radius of x units. 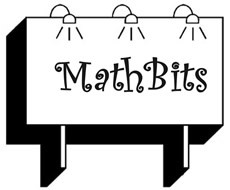 A right triangle has legs of x units and x - 1 units. Express the total area, in square units, of all three shapes (in terms of x and π). The area of a circle is expressed as 9πx2 square units. Express, in terms of x, the diameter of the circle. Mrs. Smith is using 8 in. by 12 in. sheets of construction paper to make jelly bean baskets for her second grade students. She cuts congruent squares from each corner of the paper, and folds up the sides to create the open basket. Express the volume of the basket, in terms of x.